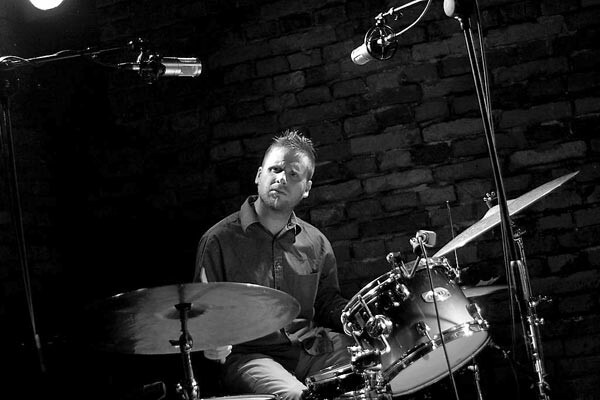 Jazz drummer Tim Daisy is a Chicago fixture who can finesse a swinging groove or detonate a free-improv blowout with equal aplomb. The many bands he plays with include international improvising quartet Inner Ear, the brawny Engines, and James Falzone's shape-shifting Klang. He's written chamber jazz for Vox Arcana and postbop with the New Fracture Trio, and this weekend he unveils his first composition for a significantly bigger group: Gestures for Large Ensemble, for 12 musicians, will score a new work called This Is Not a Dance Concert by Chicago dance company the Seldoms. They'll present it three times on Sat 2/4 at the Harris Theater, at 7:00, 8:15, and 9:30 PM; for more, see Laura Molzahn's Reader Recommends. Daisy met the Seldoms' artistic director, Carrie Hanson, in summer 2009, when he was giving a solo concert at Experimental Sound Studio. He ended up writing and performing a solo percussion piece for Marchland, which the company premiered in March 2010 at the Museum of Contemporary Art. For This Is Not a Dance Concert, Daisy and Hanson began working independently, but for the past month they've been rehearsing together, editing and reshaping their material. Daisy paid for rehearsal space and recording with a $1,100 grant from New Music USA, and he raised $3,630 through Kickstarter to cover artist fees. Joining Daisy in the ensemble, where he'll play percussion and marimba, are clarinetist James Falzone, trombonist Jeb Bishop, trumpeter Jaimie Branch, pianist Paul Giallorenzo, bassist Anton Hatwich, bass clarinetist Jeff Kimmel, violist Jen Clare Paulson, pianist Marc Riordan (who'll double on percussion), drummer Frank Rosaly, percussionist Lilliana Wosko, and bassoonist Katie Young. They're all accomplished improvisers, and Daisy's composition calls for plenty of improvising. Every performer has some written material to work through at his or her own pace, and to help create thematic consistency some of that material turns up in everyone's parts. The musicians will be broken up into four subgroups for most of the performance—two in the lobby, one backstage, and one in the main stage area. The audience, also in four groups, will be guided around the theater with the dancers, and everyone, crowd included, will end up onstage. Daisy has already recorded three short versions of the piece and plans to collect them on a release from his CD-R label Relay in the fall. The Sweet Cobra guitarist has died of cancer.